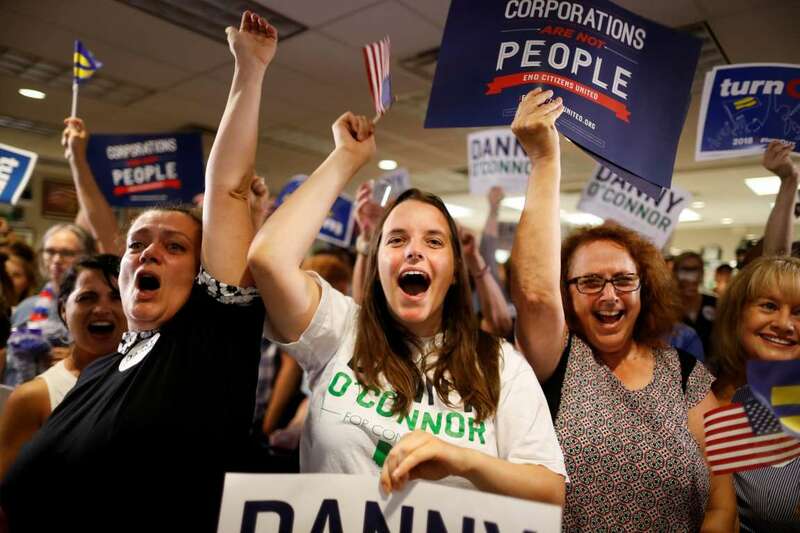 Supporters of Democrat Danny O'Connor, the Franklin County recorder, cheer during an election night watch party Tuesday in Westerville, Ohio. The tight race between Democrat Danny O’Connor and Republican Troy Balderson in a deep-red Ohio House district Tuesday reinforces a trend that has been developing for more than a year: Democrats are routinely beating their 2016 performance by double digits — a pattern that puts dozens of GOP-held House seats at risk and even gives Democrats hope of flipping the Senate in November. In Ohio’s 12th Congressional District, which encompasses the northern suburbs of Columbus and rural expanses to the east, voters preferred President Trump by 11 points and GOP Rep. Patrick J. Tiberi by 37 points in 2016. But with votes still being counted late Tuesday night, those voters showed a marked shift away from Republicans. The war for the control of Congress has been, for a year and a half, fought in a series of such skirmishes — their names ringing in the ears of Washington political operatives like famous battlefields: Georgia 6. Arizona 8. Pennsylvania 18. And Alabama — never forget Alabama. [post_ads]The battle moves now to a broader tableau, away from one-offs marked by floods of outside spending and heavy national media coverage to a 435-district scramble where any one contest will have difficulty standing out. In race after race, national Republican groups have intervened with spending to offset strong fundraising from Democratic candidates. More than $6 million was spent to benefit Balderson, according to pre-election campaign finance reports, versus the $1.2 million spent in support of O’Connor. Trump personally endorsed the GOP special election candidates and, in some cases, held political rallies to drum up votes among supporters who might not be inclined to back a generic Republican, such as Balderson, a longtime state legislator who shied away from an enthusiastic embrace of the president. Now, with the battlefield expanding to dozens of House districts and a handful of key Senate races, those particular advantages stand to be diluted. Instead, political strategists say, the fundamentals will become more salient. Democrats need to win 23 Republican-held seats to claim the House majority. A net gain of two seats will flip the Senate, but many more Democrats are vulnerable to Republican challengers this year. Republican campaign officials acknowledge the head winds but say they are confident that a strong economy, smart campaigns and targeted spending by national GOP groups will mitigate the Democrats’ advantage. They point to an overall 7-2 record in the special elections for GOP-held congressional seats before Tuesday. But that tally obscures the larger trend. In an April 2017 Kansas race, Republican Ron Estes beat Democrat James Thompson, but only by six points in a district Trump won by 27. Two months later, Republican Ralph Norman won a South Carolina seat — by three points in a district Trump won by 19. In an Alabama shocker, Doug Jones became the first Democrat to represent his state in the Senate in two decades. And in March, Democrat Conor Lamb broke through in western Pennsylvania, eking out a 755-vote victory in a district Trump won by 20 points. What has been more telling has been the relative stability of the Democratic campaign message. Virtually every Democratic special-election candidate has run on health care and economic fairness — not taking direct aim at Trump and his administration as much as a Republican policy agenda that they say favors the rich and well-connected over ordinary Americans. Republicans, meanwhile, have flitted from issue to issue seeking to promote their own candidates and disqualify Democrats. Individual candidates have been at sea trying to focus on local issues while outside groups prosecute national lines of attack on their Democratic opponents. Early hopes of riding last year’s GOP tax cuts to victory have largely faded along with the tax bill’s popularity; more recently, Republicans have seized on calls by some liberal Democrats to abolish the Immigration and Customs Enforcement agency as fodder for attacks. But for candidates such as Lamb and O’Connor, the GOP has had a hard time making the charge of radicalism stick. More frequently, the play has been guilt by association — specifically, association with House Minority Leader Nancy Pelosi (D-Calif.), who has near-universal name recognition among voters. Ads attacking Pelosi’s “San Francisco values” derailed Democrat Jon Ossoff’s bid for a suburban Atlanta seat, and O’Connor was tripped up last month after suggesting, under persistent questioning by MSNBC’s Chris Matthews, that he could end up voting for Pelosi as speaker after saying that he wouldn’t. O’Connor also faced ads accusing him of being soft on illegal immigration and supporting cuts to Medicare. “Message whiplash,” O’Connor pollster Jason McGrath called it Tuesday before polls closed. If Balderson ultimately prevails, it is Trump, ironically, who may deserve the lion’s share of the credit for pushing him over the top. At a Saturday rally in suburban Delaware County, Trump delivered effusive praise for Balderson and mocked “Danny Boy,” predicting a “red wave” that would wash over the nation come November.